New Return Men for the Ducks? With spring practice starting, players will get a chance to knock the cobwebs off when it comes to playing their positions. Some players, however, will also get a chance to see how they perform in different roles on both sides of the ball. One position in particular is a big deal for Duck football, and that is being a return man for an athletically elite program. We have seen many players handle this role with intensity in the past. Who can forget De’Anthony Thomas’ opening kickoff return against Texas in the Alamo Bowl? Or even many of the other kickoffs he ran back for momentum-changing touchdowns. It’s a role that must be handled with explosive athleticism, speed, and awareness. If a player returns a kickoff or punt for a touchdown, it can become a game-changing moment for any team. Devon Allen returns a kickoff for the Ducks. The big question is, who will the Ducks assign these roles to for the upcoming season? We’ve seen the track-star speedster, Devon Allen fill in the big shoes of Thomas last season. Byron Marshall and Charles Nelson also stepped into this role returning punts and kickoffs for the Ducks as well. However, after Allen sustained an injury in the Rose Bowl from the opening kickoff, it led many people to question whether it’s safe to have certain players returning kicks and increasing their chances to become injured. 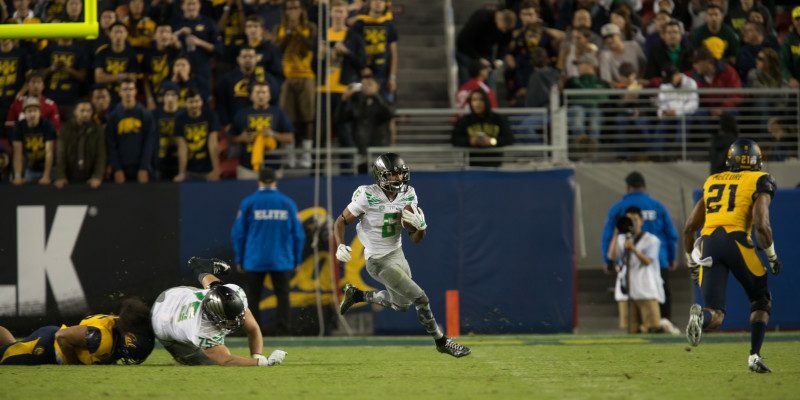 Although Allen was an ideal candidate for this role with the Ducks, his injury posed a threat to a receiving corps that was already beat up heading into the offseason. So this brings up another question: Who will be the headlining return man for Oregon this season? It very well could be Allen again, considering the wide receiver position will have a little more depth with the return of Bralon Addison, and newer additions like Alex Ofodile. However, the Ducks will still have to be smart about who to use when it comes to kick -returning in order to prevent further detrimental injuries. We saw an example of this when Oregon decided to use punt returner, Johnathan Loyd, a former point guard on the basketball team. He didn’t quite have a specific position on offense, but he was utilized for his athleticism to add explosiveness to an important position without jeopardizing the health of starting players. Byron Marshall celebrates a touchdown. The Ducks aren’t lacking any players when it comes to their athletic ability, but it is something they will have to think about moving forward in order to preserve their key players for an entire season. Allen, along with Marshall and Nelson, will still be the go-to selections for this role, but expect there to be more players getting touches on kickoffs. We could see a lot of new players step into this role throughout spring practice and the spring game as we get closer to the 2015 season. Things will get interesting for the kick-return role as more practices unfold as we approach this year’s upcoming Spring Game on May 2nd.